Seeing a total solar eclipse is one of the few achievable items on my bucket list, and I've known for awhile that there would be one just a couple of hours away on August 21, 2017. 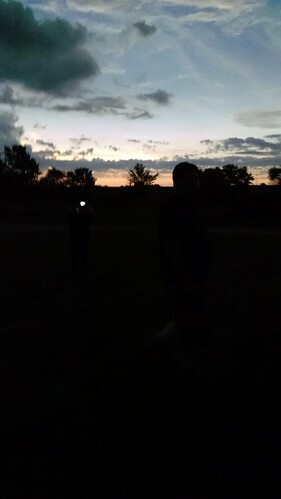 We purchased a camping spot in Lathrop, Missouri, a couple of hours from home, and very near the center line of totality. Lathrop is a small town, and we thought we might enjoy that more than the huge event that was planned in St. Joseph. Also, we were able to get a camping spot with electricity, which is always a plus. In the days before the eclipse, we watched the weather forecast - maybe clouds and rain, maybe not. Over the weekend, we mentioned our concerns to someone at the astronomy club. "You already have a spot?" he said. "Then go. You will still have fun." Even on the drive down Sunday afternoon, watching heavy clouds, we pondered switching and heading towards Saint Louis, where my aunt's backyard was also in the path of totality. But we had left the cat home alone, and STL would be a longer drive home for us. We decided to stick with Lathrop, reminding ourselves of our friend's admonition - "You will still have fun." We camped at the Antique Show Grounds, which appeared to be a cross between a normal county fairground, and one of those old town reconstructions. It wasn't too crowded where we camped, and we had a nice southern view. Monday morning, we got up, found the coffee truck, drove into town for a couple of errands, and came back to the camper. Then it started rain. Thunderstorm, actually - for an hour and a half. I dared to hope that it would clear things out for later in the day. After the rain stopped, we walked around and looked at some of the antique doodads. My favorite was an honest-to-goodness Burma Shave sign. Our friend Kim drove down from Des Moines and arrived in time to watch the eclipse with us. 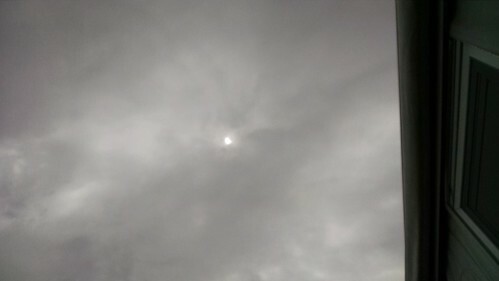 The clouds were still thick, but occasionally there would be a "sucker hole" where we could see the sun. 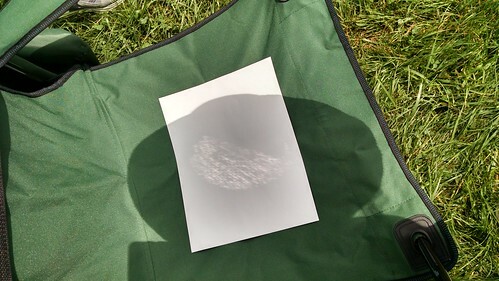 I used my straw hat as a pinhole viewer. We could see the growing eclipse until just before totality. We could definitely feel it getting cooler, and darker, although that didn't seem much different than when thick storm clouds roll in. I am fairly sure I saw the "diamond ring" just before totality. Then, suddenly, it got dramatically darker. There were enough clouds that we could not see the corona, but we definitely knew that something different had happened. It was much darker than could be explained by clouds. There were still lots of ooh and ahs from folks nearby. We could see the 360 degrees of dusk, but never did see the eclipsed sun. After a couple of minutes, it lightened up again, and totality was over. I told Terry and Kim, "Even though we didn't SEE the total eclipse, we can absolutely say we EXPERIENCED it." We found out later that, had we hopped in the car and driven five or ten miles to the south, we could have seen totality. But who knew? The good news is, the next eclipse in the US in only seven years away - April 8, 2024 - and my niece and sister-in-law both live in the path of totality. Clear a spot, ladies, because we plan to be there. But in 2017? We DID have fun. 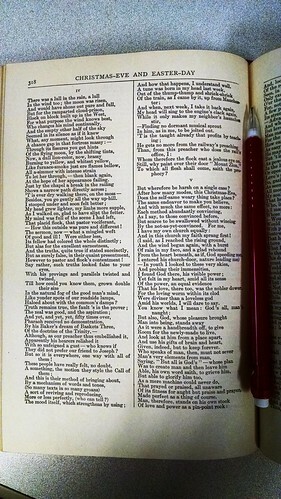 A page from the Browning volume, with pencil for scale. Now multiply that by two and a half inches. Wow. For the most part, I am a fan of modern times. I'm not one to get nostalgic for the good old days. 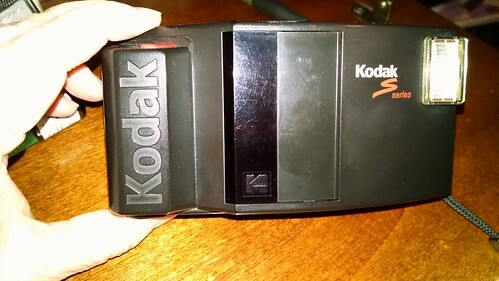 Even things I miss from the past, like being able to see the Milky Way from my backyard, I would only want to regain if we can keep our modern medical advances, digital photography, and wi-fi. One of the most brilliant parts of the internet, and specifically YouTube, is being able to find one-off tidbits from the past that you never expected to see again. The first time I gave YouTube a mental high five was after I Googled "bowie crosby drummer boy". I grew up watching Bing's hokey Christmas special every year, and when I was in college, I was naturally intrigued when I heard Bowie was going to be a guest. Seriously, Der Bingle and Ziggy Stardust? How was THAT going to work? Beautifully, as it turned out, and for 30+ years I wished I could see that performance again. Nowadays, I can pull up this video any time I want, which usually means every December, but with David Bowie's passing, I need an encore in January. Thanks, fellas, for taking this chance. This caught my eye at the grocery store last week. Whaaat? 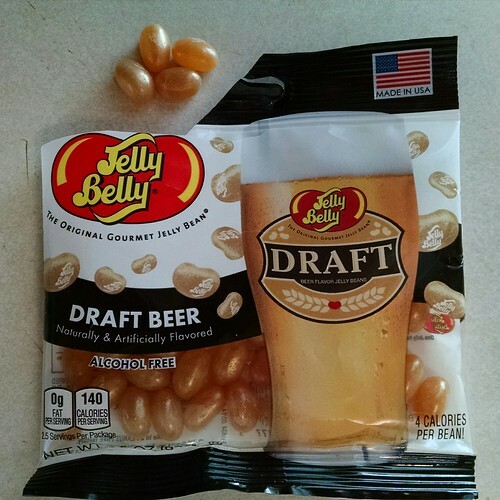 How did they make beer-flavored Jelly Bellys? What would that even taste like? I just had to find out. When I opened the package, there was a definite beeraroma, but it was not so much the scent of a freshly-pulled lager, as the funk of a low-end tavern on Sunday morning. As far as taste, I only noticed the slightest hint any discernable beer taste, but T (not a beer drinker) described the taste as "nasty", so there must have been something to it. They do have a sort of stale-beer aftertaste. On the plus side, they are gorgeous - shiny and iridescent, like little amber jewels. They are possibly the prettiest Jelly Bellys I've ever seen. Just don't eat them. Fortunately, these were also on the display. Forget the pancakes. 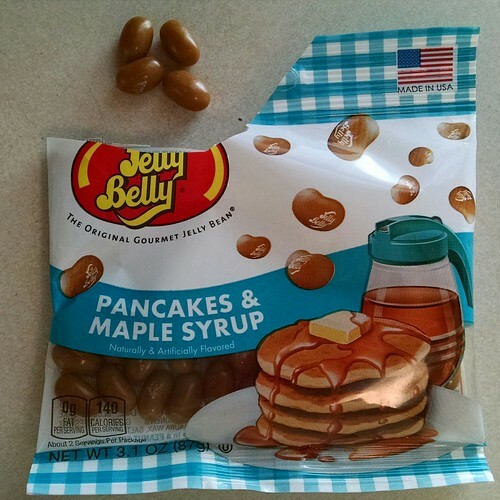 This is all about the maple syrup, and why wouldn't that be a logical Jelly Belly flavor? They have a solid "candy constructed to taste like pancake syrup" flavor, which T declared "better than those other ones." If you want your sugar to taste like something sugary, this is the way to go. But don't chase them with a beer. My fabulous coworker Terri returned from an out-of-office excursion the other day, and dropped this book on my desk. She had been to one of our thrift stores, and as an avid reader, she always checks the books to see if there is anything she must have. On this occasion, she did not so much want the book herself, as she wanted someone to want it. Maybe someone who likes poetry, and can appreciate a 120-year-old book, and the handwritten notes therein. I know nothing about Browning, except that Elizabeth Barrett fell in love with him and wrote the heck out of sonnets because of it. My first comment after thumbing through the pages was, "There are a LOT of words." In order to pack all of the words into one volume, they used tiny print and two columns, so each page is crammed full of Victorian verse. What little I've read, I've found to be slow going, and not particularly engaging, although there were occasional moments of what appeared to be poetical smart mouth. So, I consulted with the oracle, Wikipedia, which assured me, "His poems are known for their irony, characterization, dark humor, social commentary, historical settings, and challenging vocabulary and syntax." I should be able to get behind that. 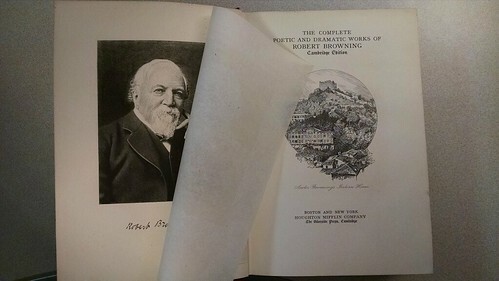 It also noted that even Browning's fans were sometimes vexed when his poems were too long or too dense. Still, it's lovely having a bit of the 19th century sitting on my desk in a 21st century office. 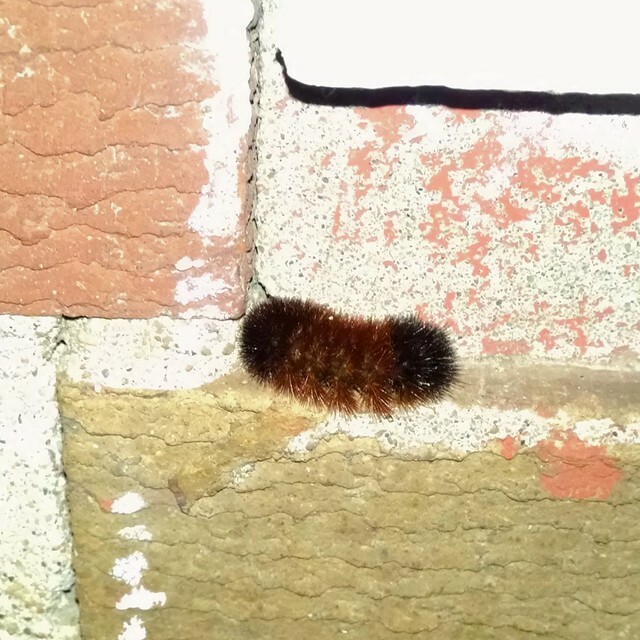 This little guy was hanging around under our side door earlier this week, when the weather was unseasonably not miserably frigid. Tonight, after a day of fog, rain, frozen stuff, snow, and now declining temperatures, he is gone. I trust his instinct has led him to a safe place where he can ride out the next few days. As for me, I will be making a double batch of beef stew tomorrow. Mmm.